After underwhelming critical and commercial results for The Amazing Spider-Man and The Amazing Spider-Man 2, Sony Pictures found themselves in a familiar situation, as they considered rebooting this beloved character yet again. Last year, the studio jointly announced with Marvel that Spider-Man will make his Marvel Cinematic Universe debut in Captain America: Civil War, with Tom Holland starring as the new Peter Parker. As it turns out, though, one of The Amazing Spider-Man stars may have been glad the franchise came to an end, Sally Field. When asked if she liked the movie during an interview with The Howard Stern Show, the actress had this to say. "Not especially. It's not my kind of movie. But my friend Laura Ziskin was the producer, and we knew it would be her last film, and she was my first producing partner, and she was a spectacular human." Laura Ziskin ended up passing away in 2011, after a seven-year battle with breast cancer. Her death came a year before The Amazing Spider-Man hit theaters in the summer of 2012, which spawned the 2014 follow-up The Amazing Spider-Man 2. Sally Field portrayed Aunt May in The Amazing Spider-Man and The Amazing Spider-Man 2, a role the actress lamented was hard to make "three-dimensional". Here's what she had to say, when asked how much thought she put into playing this character, although she did praise her co-star Andrew Garfield. "Not a great deal. Because it's really hard to find a three dimensional character in it, and you work it as much as you can, but you can't put ten pounds of s*** in a five pound bag. You have to try to make it as logical a performance as you possibly can. Andrew is such a lovely, lovely, actor, so we found a relationship in who we were, and that was fun." The new Spider-Man will feature Marisa Tomei as Aunt May, with the story following the title character throughout his high school years. The producers are also ditching the well-worn origin story, with Peter Parker already established as Spidey when he debuts in Captain America: Civil War. 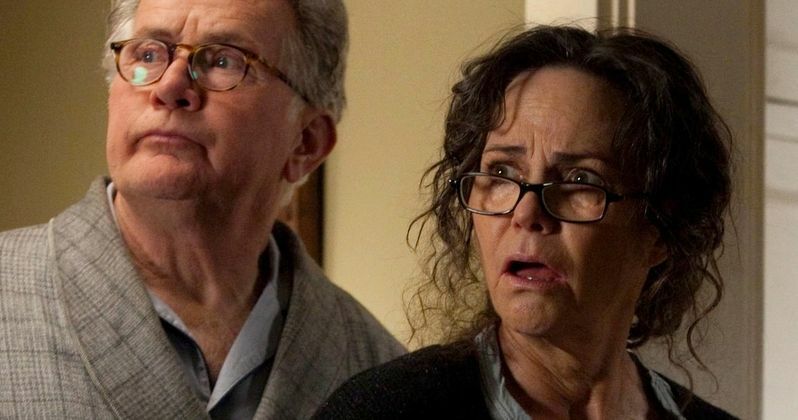 What do you think about Sally Field's criticism of Aunt May and The Amazing Spider-Man movies? You can listen to her audio interview below with Howard Stern below, where she discusses playing Aunt May.